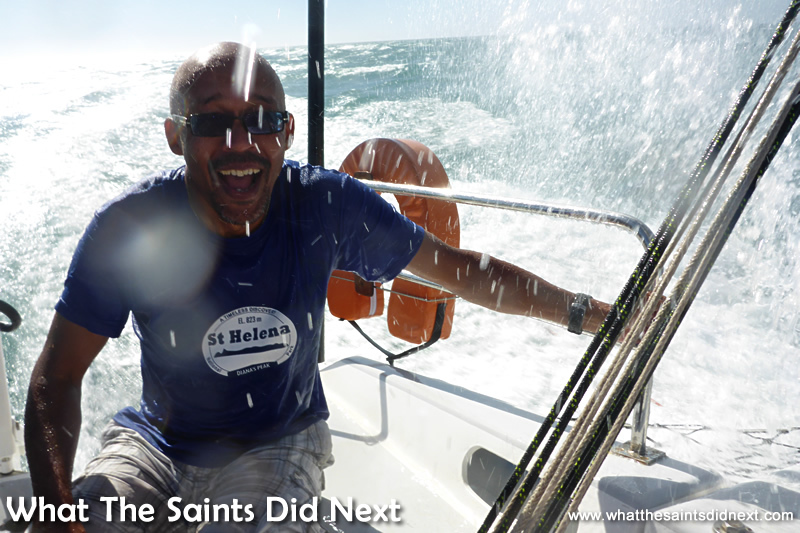 Soaked but having the most amazing time sailing St Helena Bay. 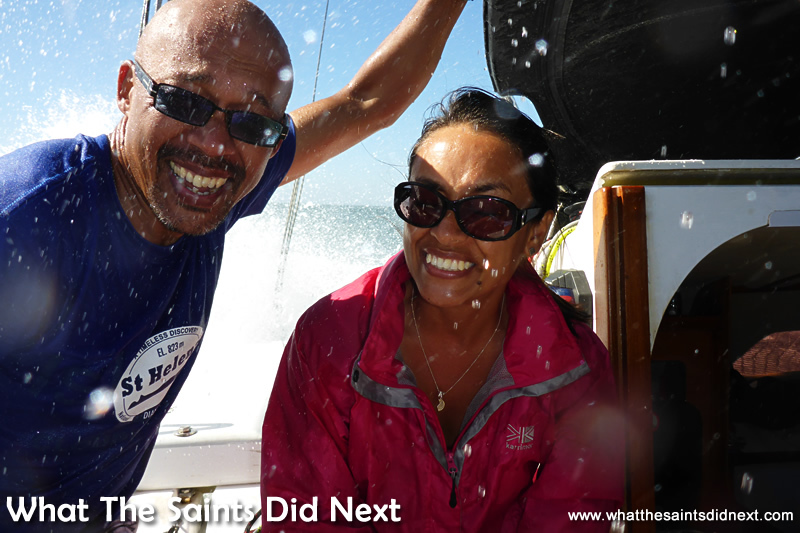 Here I am with Sharon, screaming and sailing St Helena Bay at an eye popping 18.5 knots on a 31 foot trimaran with 37 knot winds whipping freezing cold salt water all over me – and loving it. (Ok, the water temperature is actually 12C but let’s not let that spoil a good story). Island boy or not, I’ve never really wanted to sail on a yacht; to me they just seemed too small to be safe. The most I’d done was visit a couple of yachts anchored in Jamestown. When I woke up in a Cape Town hotel room this morning I had no idea this amazing experience lay in store for us. Banjo anchored in the bay at sunrise on the morning of our adventure. Well, in January we photographed the Governor’s Cup Yacht Race arrivals in our home island of St Helena and met some wonderful people involved in the race. 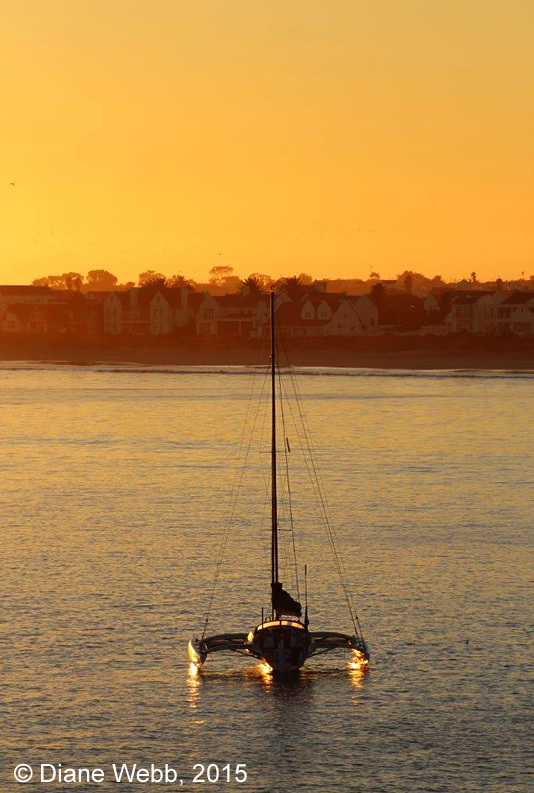 One of those was Diane Webb, wife of skipper Kevin who owned and raced the yacht, Banjo. 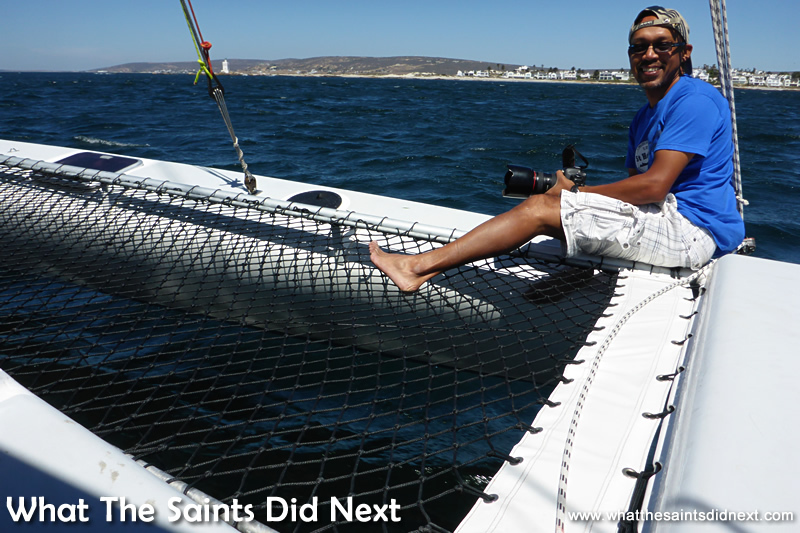 In 2013 and 2015, Banjo, won line honours, and is the current record holder in the South Africa to St Helena, GCYR. 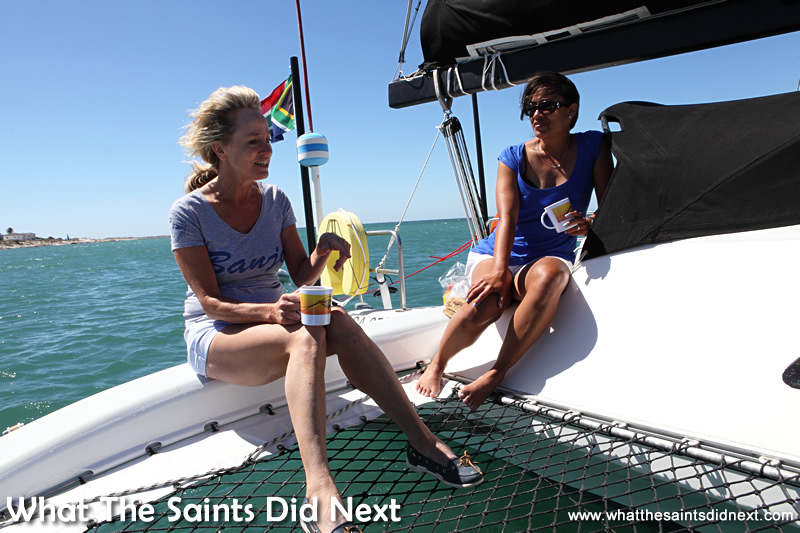 Diane had kindly offered to show us St Helena Bay when we visited South Africa, so here we were. When Diane collected us she mentioned a surprise, but even when we saw Banjo anchored in the bay there was still no inkling of the thrill to come. 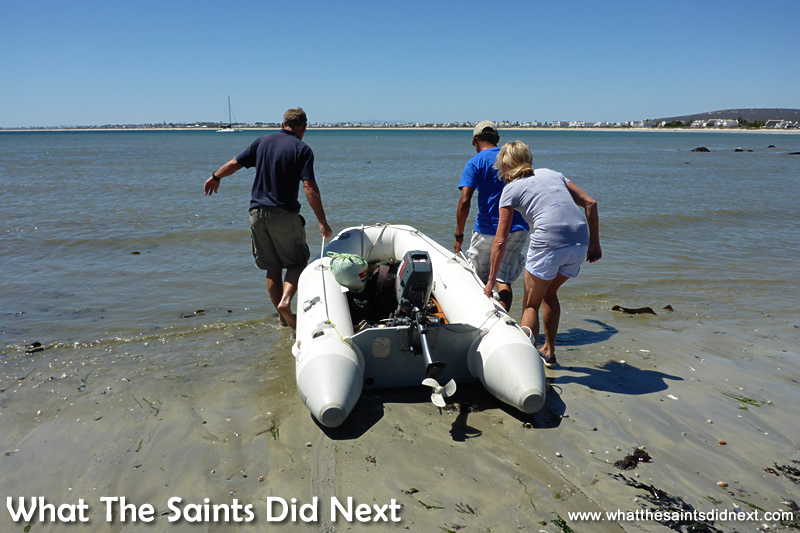 We dropped our bags off (that’s another story) then set off to meet other members of the Port Owen Yacht Club at a beach social just around the headland; we were going to sail there. Launching the little Ukulele. Note Banjo at anchor in the background. 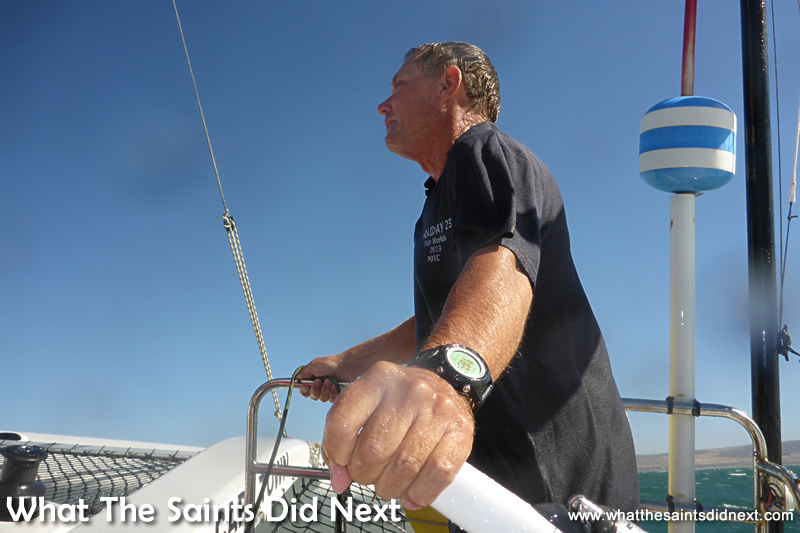 On the gentle first leg to the beach party, sailing St Helena Bay. Kevin using the sail control ropes. Riding the outrigger sailing St Helena Bay. First adventure was the four of us squeezing into the tiny Ukulele inflatable and trusting the little sewing machine of a two horsepower engine to drive us out to the waiting Banjo! My first experience of sailing was good fun. A light breeze pushed us along at about 8 knots using just the jib sail. (I was quickly learning the lingo). Somehow, knowing Kevin had conquered the mighty Atlantic in the Governor’s Cup, completely removed any apprehension I might have had, which I must admit, surprised me. Observing Kevin controlling the yacht so competently reaffirmed my confidence that we were in good hands. It was surreal, anchoring off a beautiful little white sand beach, having some coffee onboard Banjo before motoring ashore in the Ukulele to join the club crowd. The all important speed gauge meter thingy! 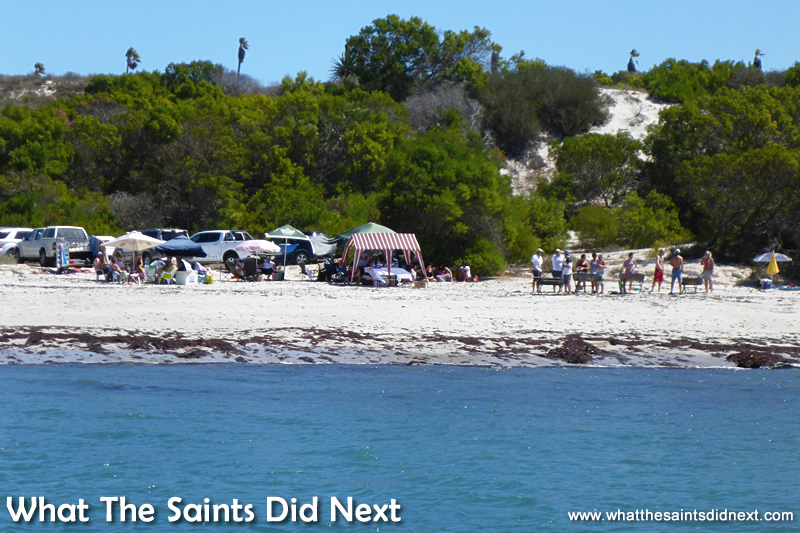 The Port Owen Yacht Club’s social on the beach. Sailing St Helena Bay. Making coffee after the first leg, while at the second anchorage. How about this for a tea room. Sailing St Helena Bay. 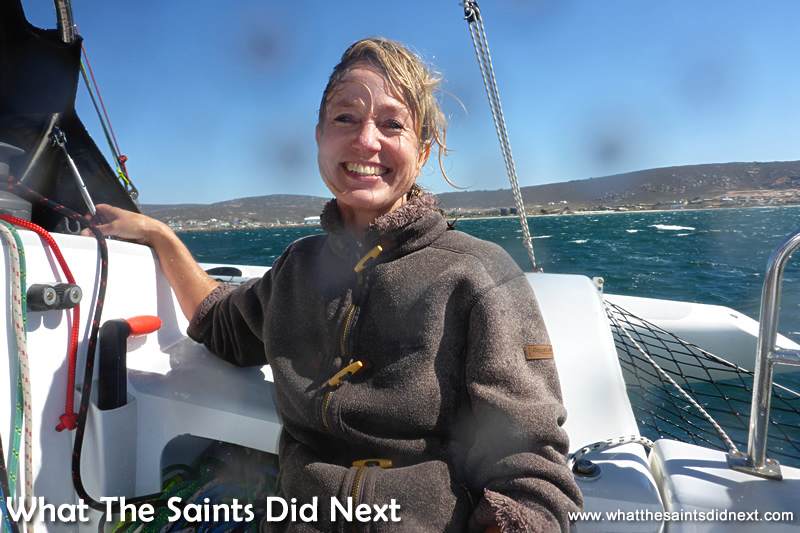 After meeting some fascinating people from the yacht club and chatting for a while, we returned to Banjo; we were going to sail further along the coast, about twenty kilometres, to the Port Owen marina where she is normally berthed. By now the wind had really picked up; 37 knots registered on the gauge. The sea was also more agitated and the wave tops were whipped white from the wind. For this second leg of the journey, Kevin deployed the main sail, however not fully; ‘reefed’ to use the nautical expression for a partially retracted sail. The jib was out as well, but this too was ‘reefed.’ This would keep the speed down and be easier to manage in the strong wind. Banjo is built for speed. She is light, sleek and immaculately maintained. Once the anchor was stowed and the main sail turned to the wind, Banjo leapt forward forcing us all to hang on tight. 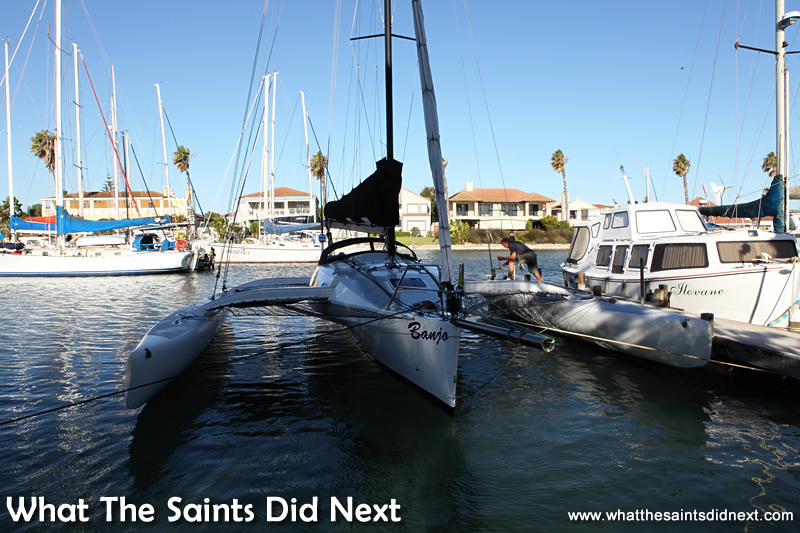 The outrigger, or hull, on the right side lifted clear of the water and South African flag on the back of the yacht streamed straight back. And that’s how I ended up here, hanging on with both hands, legs braced and grinning like crazy. 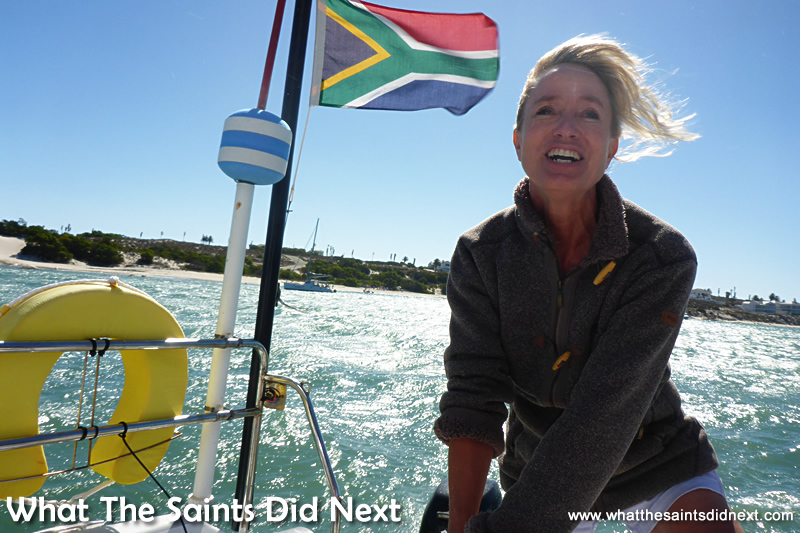 Diane taking a turn at the helm as we set off, sailing St Helena Bay. Not the easiest selfie to take. Us sailing St Helena Bay. Kevin at the helm and in control. “Darrin! Eighteen knots,” calls Kevin, from the helm position behind me. I can barely get my eyes open because of the wind and the relentless biting sea spray, yet Kevin is steering with one hand, managing the main sail with the other and simultaneously reading the digital display gauge in front of me. How does he do it, I wonder? This is exhilarating. The RMS St Helena, the ship that serves St Helena, cruises at around 15 knots so I know this is fast. I only wish we had an audience! The yacht is moving effortlessly and the jerking movement as we skip across the waves feels like a powerful dog straining at the leash, begging to be let loose. The forward view before another smack in the face from the sea spray. A very cold place to sit with the water splashing in. 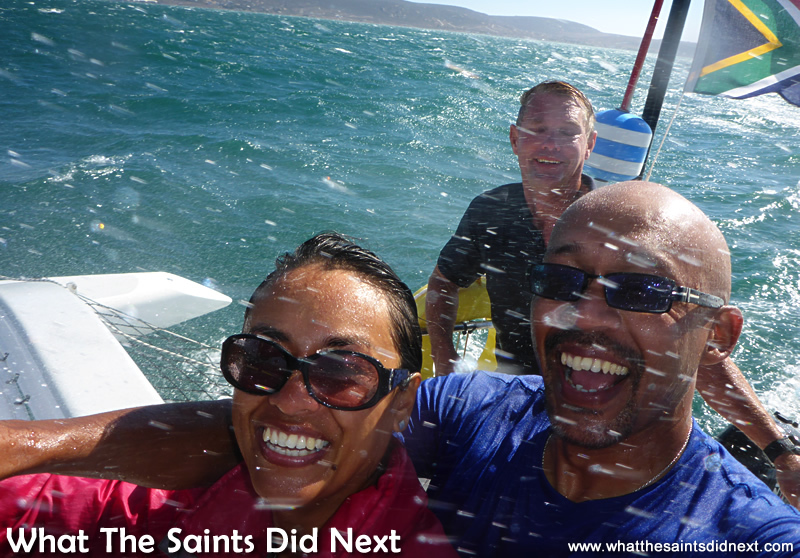 Fun sailing St Helena Bay. What 18.5 knots looks like! Sailing St Helena Bay. The four of us are now soaked to the skin, but Diane assures us we can borrow dry clothes. This is only a two day visit so I’ve only brought one change of clothing. While the right hand outrigger is well clear of the water, the left side is down and the struts are catching the waves and belching huge dollops of cold sea water into the cockpit area. Talk about take my breath away! We can only laugh at the shock of cold water each time. We’ve put the DSLR camera away, but even though the compact is waterproof we are struggling to take pictures in the small space and hold on at the same time. My only regret is we probably aren’t doing justice to the experience with the pictures. The colour coded control ropes run through a brake control. The sails are all controlled from the cockpit area via colour coded ropes and an intricate pulley system. 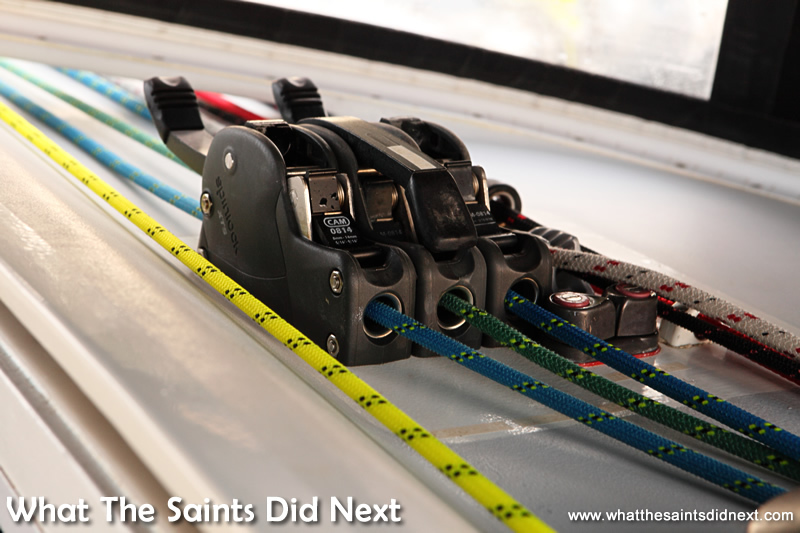 To deploy a sail we pull on one side while simultaneously releasing the opposite rope, then lock it off in special cleats. Kevin makes it look easy, but when I have a go I’m surprised at how much strength is needed. Over the wind and the sea spray I ask Kevin more about the controls and he demonstrates how quickly the yacht can be depowered by turning the bow into the wind. 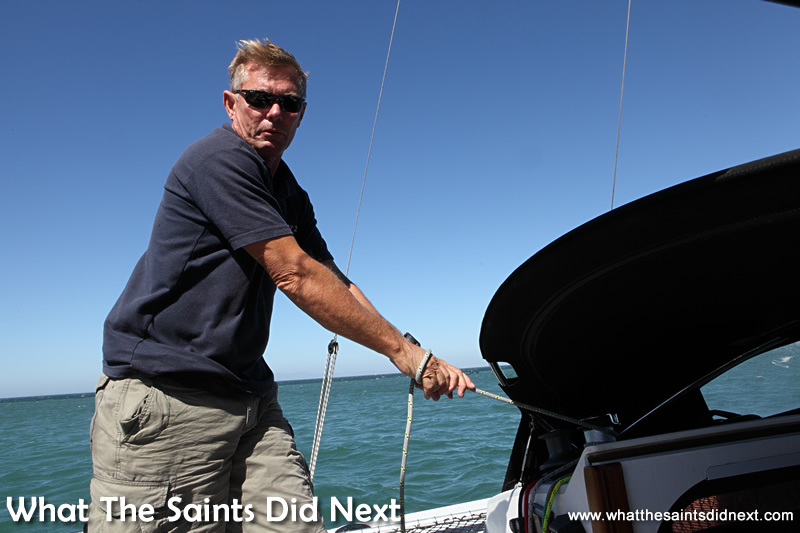 He then shows me, with just a flick of the wrist, how the ‘spill’ from the main sail can also control the speed. 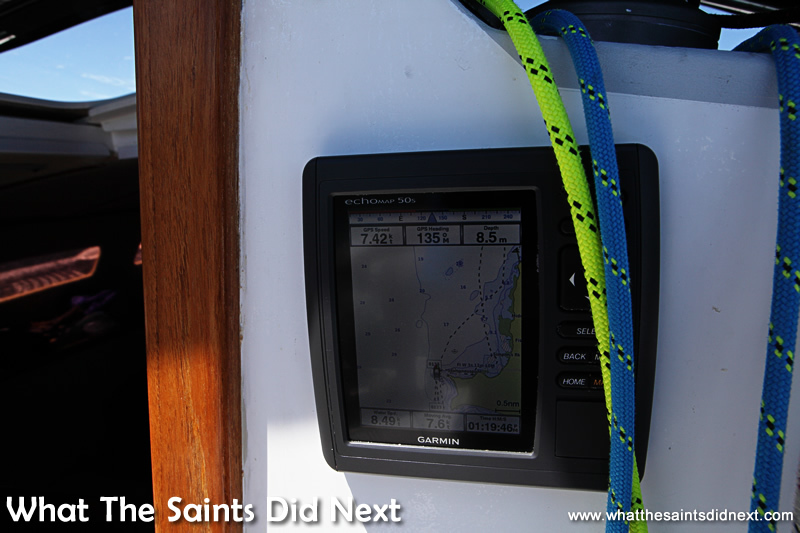 We cover the 20 kilometre journey across St Helena Bay quickly and soon we are slowing down and making our approach into the Port Owen marina. 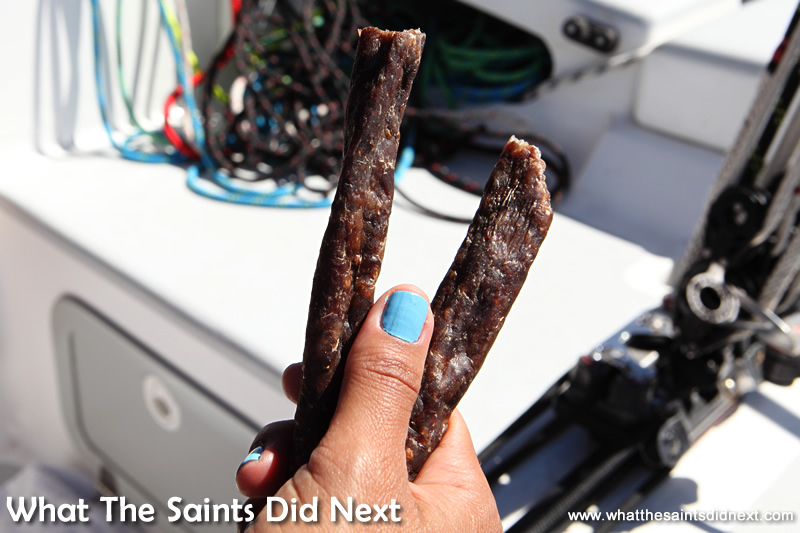 Droe Wors, the beef snack we used to combat the salt water taste from all the sea spray. 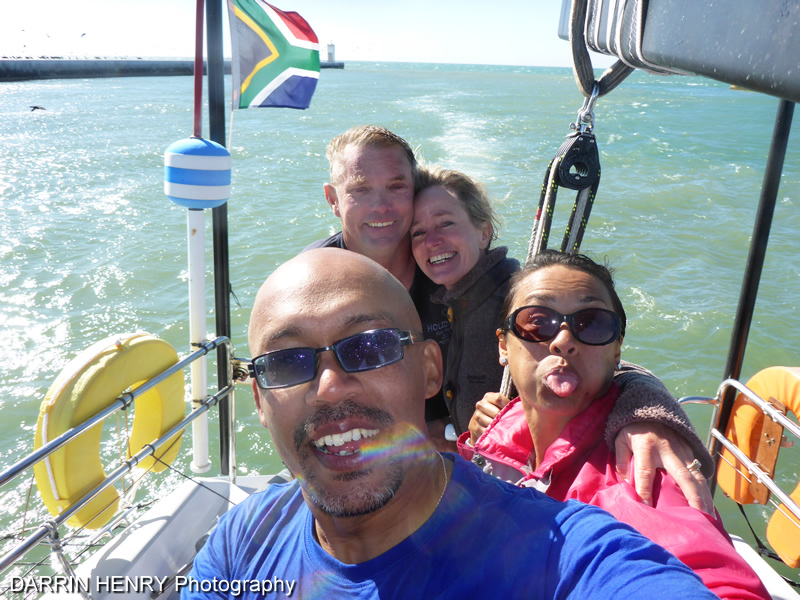 The group selfie as we sail into the harbour. 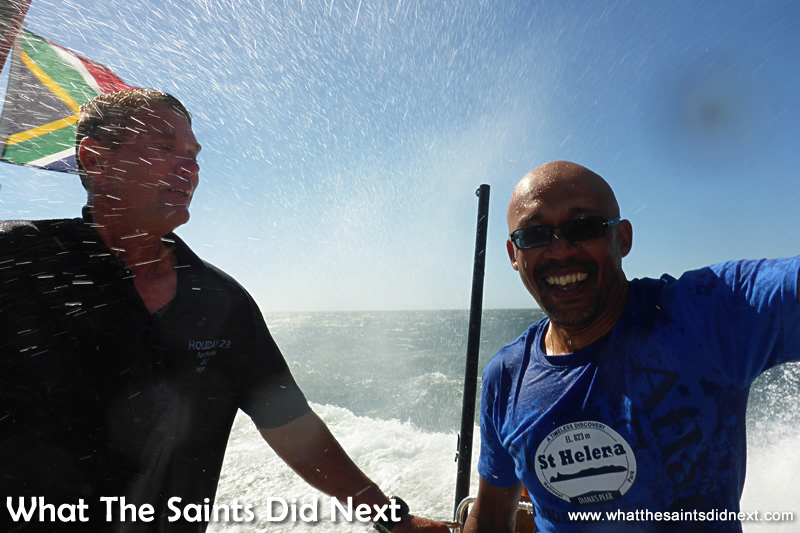 What a great day sailing St Helena Bay. I help where I can, untying a rope here and passing another rope there, but in truth I think Kevin is indulging me and could probably do all this a lot faster on his own! Even so, Sharon looks impressed and I haven’t fallen over the side, so, well done me! Banjo is soon secured in the shelter of Port Owen marina. Even the process of washing down the yacht, stowing everything away and applying all the covers is fascinatingly precise. Kevin does all the maintenance work on Banjo himself and it’s obvious the yacht is not short of some serious TLC. 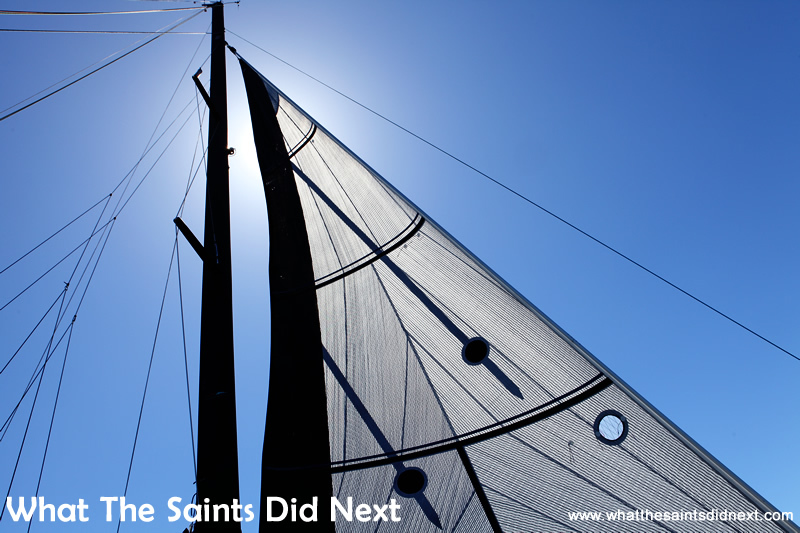 I don’t particularly have an urge to now sail yachts, but importantly I no longer have that fear factor that prevented me from doing so before. It’s been an amazing day out with Diane and Kevin and their yacht, Banjo. I’ll go so far as to say I’ve just had one of the most memorable days of my life. Banjo safely secure in her home port marina. It was really nice meeting you guys at Shelly Point . 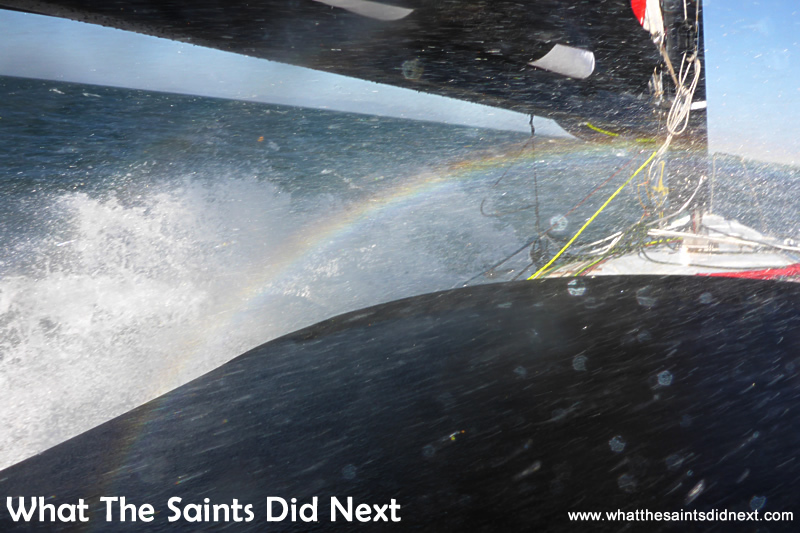 At least you can now tick ” extreme sailing ” off your list . Banjo is a speed machine and Kevin sails her well . Sounds like you are both enjoying yourselves and that is wonderful . We would really appreciate you giving Julie our best regards as it is now a year since we visited your fascinating island . 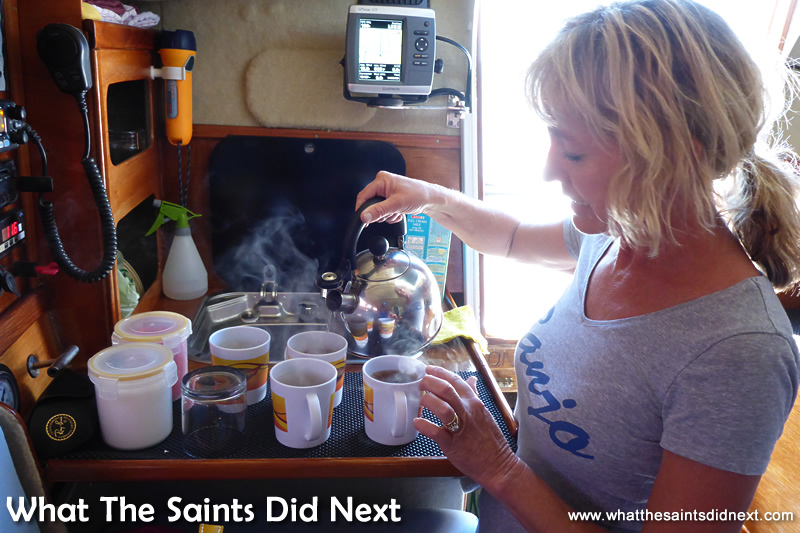 She was our ” Saint ” during our time on St Helena and she went out of her way and more to show us around . When we sailed off into the sunset it was sad to see your island slowly disappear over the horizon . But we still have great memories of our stay . We did kind of set a high bar very early in this whole trip, eh! Special friends indeed, thank you both for your wonderful hospitality – I’ve never been to someone’s ‘premises,’ got drenched unexpectedly and yet loved every minute of it. You guys are amazing, thank you both. Brillant stuff! You guys are really having an adventure! Cheers Wendy, thanks for the comment. You know us, a little too excited sometimes 🙂 but it’s going great. Haha! Thanks Leoni. I actually find myself smiling every time I think of that day, it was so amazing and unexpected. The RMS is bigger, although I felt completely safe with Kevin; that’s why it was so enjoyable 🙂 I think everyone should try this if they get a chance. 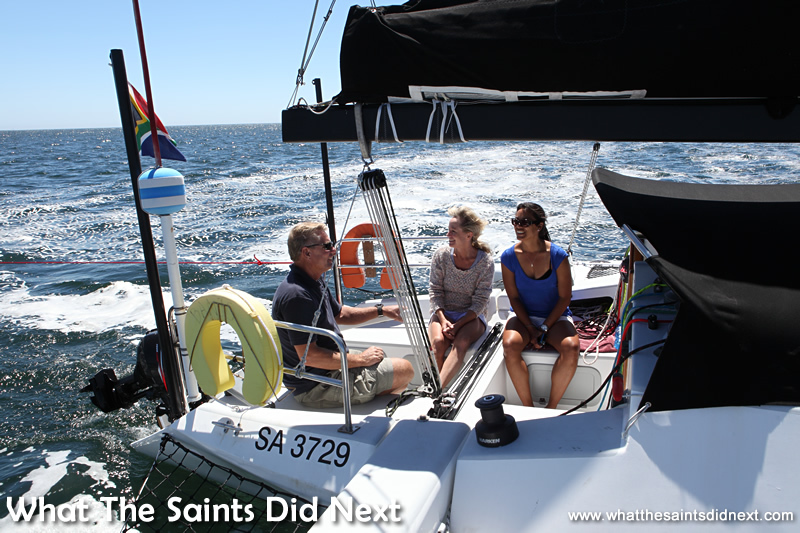 Looks like you both had fun and amazing time, bet it is far different from whale watching in our waters.